The above integrations are all currently in beta. 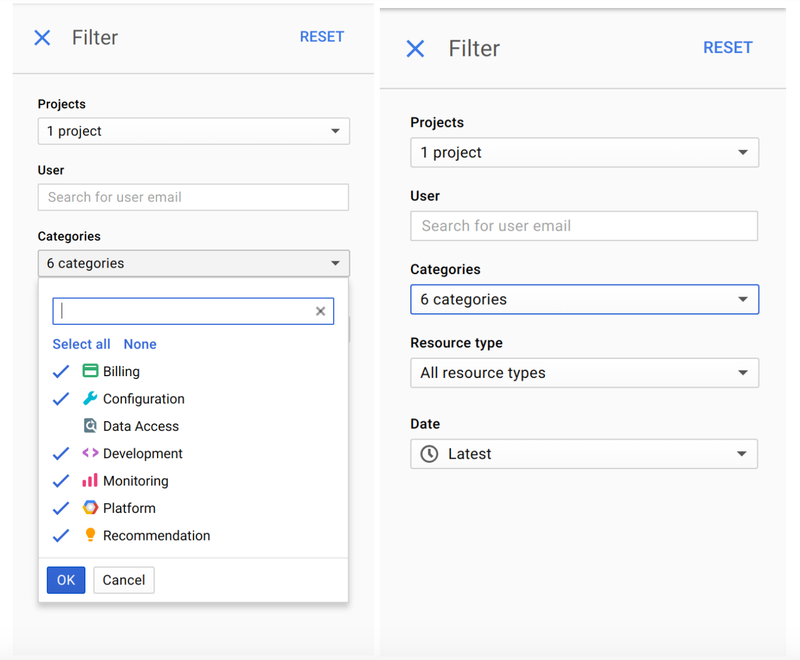 We’re also pleased to announce that audit logging for Google Cloud Dataflow, Stackdriver Debugger and Stackdriver Logging is now generally available. Cloud Audit Logging provides log streams for each integrated product. The primary log stream is the admin activity log that contains entries for actions that modify the service, individual resources or associated metadata. Some services also generate a data access log that contains entries for actions that read metadata as well as API calls that access or modify user-provided data managed by the service. Right now only Google BigQuery generates a data access log, but that will change soon. You can see a high-level overview of all your audit logs on the Cloud Console Activity page. Click on any entry to display a detailed view of that event, as shown below. By default, data access logs are not displayed in this feed. To enable them from the Filter configuration panel, select the “Data Access” field under Categories. (Please note, you also need to have the Private Logs Viewer IAM permission in order to see data access logs). You can also filter the results displayed in the feed by user, resource type and date/time. You can also interact with the audit logs just like any other log in the Stackdriver Logs Viewer. With Logs Viewer, you can filter or perform free text search on the logs, as well as select logs by resource type and log name (“activity” for the admin activity logs and “data_access” for the data access logs). Here are some log entries in their JSON format, with a few important fields highlighted. In addition to viewing your logs, you can also export them to Cloud Storage for long-term archival, to BigQuery for analysis, and/or Google Cloud Pub/Sub for integration with other tools. Check out this tutorial on how to export your BigQuery audit logs back into BigQuery to analyze your BigQuery spending over a specified period of time. We understand that there are many tools for log analysis out there. For that reason, we’ve partnered with companies like Splunk, Netskope, and Tenable Network Security. If you don’t see your preferred provider on our partners page, let us know and we can try to make it happen. 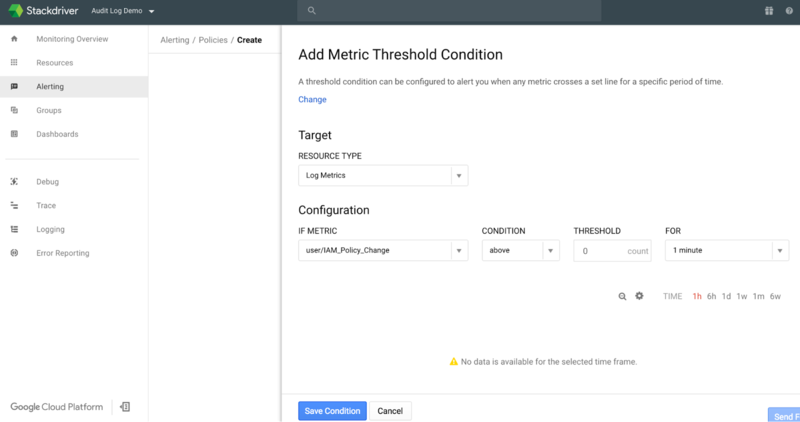 Stackdriver Logging provides the ability to create logs-based metrics that can be monitored and used to trigger Stackdriver alerting policies. 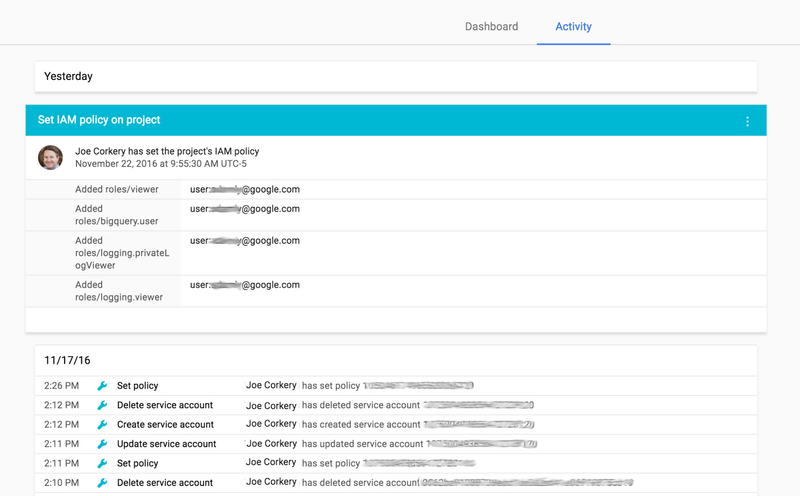 Here’s an example of how to set up your metrics and policies to generate an alert every time an IAM policy is changed. The first step is to go to the Logs Viewer and create a filter that describes the logs for which you want to be alerted. Be sure that the scope of the filter is set correctly to search the logs corresponding to the resource in which you are interested. In this case, let’s generate an alert whenever a call to SetIamPolicy is made. Once you’re satisfied that the filter captures the correct events, create a logs-based metric by clicking on the “Create Metric” option at the top of the screen. Now, choose a name and description for the metric and click “Create Metric.” You should then receive a confirmation that the metric was saved. Now, create a condition to trigger an alert if any log entries match the previously specified filter. To do that, set the threshold to “above 0″ in order to catch this occurrence. Logs-based metrics count the number of entries seen per minute. With that in mind, set the duration to one minute as the duration specifies how long this per-minute rate needs to be sustained in order to trigger an alert. For example, if the duration were set to five minutes, there would have to be at least one alert per minute for a five-minute period in order to trigger the alert. Finally, choose “Save Condition” and specify the desired notification mechanisms (e.g., email, SMS, PagerDuty, etc.). You can test the alerting policy by giving yourself a new permission via the IAM console. Let’s look at firewall rules as an example. Whenever a firewall rule is created, modified or deleted, a Compute Engine audit log entry is written. The firewall configuration information is captured in the request field of the audit log entry. The following function inspects the configuration of a new firewall rule and deletes it if that configuration is of concern (in this case, if it opens up any port besides port 22). This function could easily be extended to look at update operations as well. In the image below, you can see what happened to a new firewall rule (“bad-idea-firewall”) that did not meet the acceptable criteria as determined by the cloud function. It’s important to note, that this cloud function is not applied retroactively, so existing firewall rules that allow traffic on ports 80 and 443 are preserved. This is just one example of many showing how you can leverage the power of Cloud Functions to respond to changes on GCP. 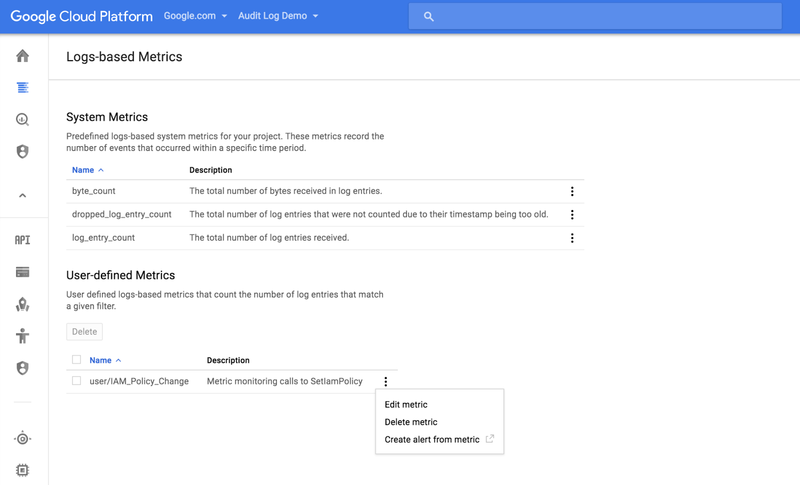 Cloud Audit Logging offers enterprises a simple way to track activity in applications built on top of GCP, and integrate logs with monitoring and logs analysis tools. To learn more and get trained on audit logging as well as the latest in GCP security, sign up for a Google Cloud Next ‘17 technical bootcamp in San Francisco this March.